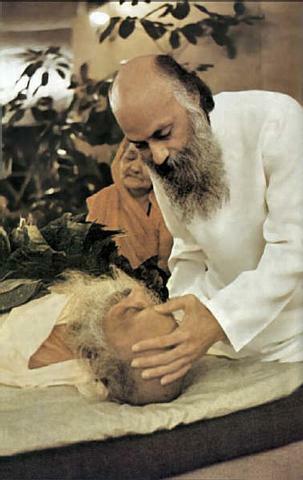 Osho, would you say something about your father’s death yesterday? IT WAS NOT A DEATH AT ALL. Or it was the total death. And both mean the same thing. I was hoping that he would die in this way. He died a death that everybody should be ambitious for: he died in samadhi, he died utterly detached from the body and the mind. I went to see him only three times during this whole month he was in the hospital. Whenever I felt that he was just on the verge, I went to see him. The first two times I was a little afraid that if he died he would have to be born again; a little attachment to the body was there. His meditation was deepening every day, but a few chains with the body were still intact, were not broken. Yesterday I went to see him: I was immensely happy that now he could die a right death. He was no more concerned with the body. Yesterday, early in the morning at three o’clock, he attained his first glimpse of the eternal — and immediately he became aware that now he was going to die. This was the first time he had called me to come; the other two times I had gone on my own. Yesterday he called me to come because he was certain that he was going to die. He wanted to say good-bye, and he said it beautifully — with no tears in the eyes, with no longing for life any more. Hence, in a way it is not a death but a birth into eternity. He died in time and was born into eternity. Or it is a total death — total in the sense that now he will not be coming any more. And that is the ultimate achievement; there is nothing higher than it. He left the world in utter silence, in joy, in peace. He left the world like a lotus flower — it was worth celebrating. And these are the occasions for you to learn how to live and how to die. Each death should be a celebration, but it can be a celebration only if it leads you to higher planes of existence. He died enlightened. And that’s how I would like each of my sannyasins to die. Life is ugly if you are unenlightened, and even death becomes beautiful if you are enlightened. Life is ugly if you are unenlightened because it is a misery, a hell. Death becomes a door to the divine if you are enlightened; it is no more a misery, it is no more a hell. In fact, on the contrary, it is getting out of all hell, out of all misery. I am immensely glad that he died the way he died. Remember it: as meditation deepens, you become farther and farther away from your body-mind composite. And when meditation reaches its ultimate peak, you can see everything. Yesterday morning he was absolutely aware of death, that it had come. And he called me. This was the first time he had called me, and the moment I saw him I saw that he was no more in the body. All the pains of the body had disappeared. That’s why the doctors were puzzled: the body was functioning in an absolutely normal way. This was the last thing the doctors could have imagined, that he could die. He could have died any day before. He was in deep pain, there were many complexities in the body: his heart was not functioning well, his pulse was missing; there were blood clots in the brain, in the leg, in the hand. Yesterday he was absolutely normal. They checked, and they said it was impossible; now there was no problem, no danger. But this is how it happens. The day of the danger, according to the physicians, didn’t prove dangerous. The first twenty-four hours when he was admitted to the hospital one month before were the most dangerous; they were afraid that he would die. He didn’t die. Then for the next twenty-four hours they were still hesitant to say whether he would be saved or not. A suggestion had even come from a surgeon to cut the leg off completely, because if blood clots started happening in other places it would be impossible to save him. But I was against cutting off the leg, because one has to die one day — why distort the body and why create more pain? And just living in itself has no meaning, just lengthening the life has no meaning. I said no. They were surprised. And when he survived for almost four weeks they thought I was right, that there had been no need to cut off the leg; the leg was coming back, becoming alive again. He had started walking also, which Dr. Sardesai thought was a miracle. They had not hoped for that much, that he would be able to walk. Yesterday he was perfectly normal, everything normal. And that gave me the indication that now death was possible. If meditation happens before death, everything becomes normal. One dies in perfect health, because one is not really dying but entering into a higher plane. The body becomes a stepping-stone. He was meditating for years. He was a rare man — it is very rare to find a father like him. A father becoming a disciple of his own son: it is rare. Jesus’ father did not dare to become a disciple, Buddha’s father hesitated for years to become a disciple. But he was meditating for years. Three hours each day, in the morning from three to six, he was sitting in meditation. Yesterday also, in the hospital also, he continued. Yesterday it happened. One never knows when it will happen. One has to go on digging…one day one comes across the source of water, the source of consciousness. Yesterday it happened; it happened in right time. If he had left his body just one day before he would have been back in the body again soon — a little clinging was there. But yesterday the slate was completely clean. He attained to no-mind, he died like a Buddha. What more can one have than Buddhahood? My effort here is to help you all to live like Buddhas and die like Buddhas. The death of a Buddha is both! It is not a death, because life is eternal. Life does not begin with birth and does not end with death. Millions of times you have been born and died; they are all small episodes in the eternal pilgrimage. But because you are unconscious you cannot see that which is beyond birth and death. As you become more conscious, you can see your original face. He saw his original face yesterday. He heard the one hand clapping, he heard the soundless sound. Hence it is not a death: it is attaining life eternal. On the other hand it can be called a total death – total death in the sense that he will not be coming any more. by the way. there is no Sarlo here. perhaps you have this site confused with another. Cheers!